Beautiful flowers needn’t be a luxury, and in fact budget bouquets can be made to fit even the slimmest budget. Obviously exotic flowers will be out, but there are many lovely, more common types of flowers that can be arranged for minimal money. In order to make the budget bouquet of your dreams, be sure to sort out your budget, colour scheme, the size of the bouquet and any extra materials that you will need before you even so much as pick up a stem. Having these details set will allow you to avoid disappointment on the day and still come up with a wonderful, fresh bouquet that won’t blow your budget. It may seem obvious, but many people forget to actually work through a budget when they are short on funds but in need of flowers. First, think of how much money you have to spend on the bouquet overall and then break this number down into smaller units. How much money will each stem cost? Will adding leaves or baby’s breath cost more? When you have a rough estimate of how much you can spend – and on what – you’ll then be able to start to get a feel for the types of flowers you can afford. Again, it might seem obvious but your budget will obviously affect the size of your bouquet. This is not necessarily a limiting variable, however, since it is up to you whether you want to do a small bouquet of more exotic and expensive flowers or a larger bouquet of less expensive, more readily available flowers. Remember too that the purpose of the bouquet may affect the size. A bouquet to be carried, for example, will need to be slim enough to fit easily into someone’s hand. A bouquet destined for a home, however, will need to be placed in a vase or similar container which itself could make it look bigger than it might otherwise. If your budget bouquet must match an already decided colour scheme then you will need to take this into account when deciding on possible blossoms. If, for example, you would like deep red flowers then you may be able to find this naturally. However, if you need bright green flowers then you might need to start considering if you prefer to dye flowers (at a possible extra charge) or if there is another colour in the scheme that might work instead. 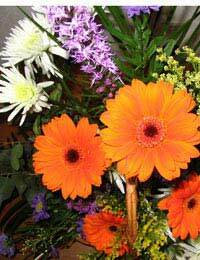 Some flowers, such as Gerber Daisies, come in a wide variety of colours whereas lilacs are really only available in, well, lilac. If you are rather crafty and have a variety of extra materials at home then you won’t necessarily need to budget for or otherwise concern yourself with making your budget bouquet perfectly suit your needs. If, however, you will also need to purchase ribbon to bind the stems, a new vase to display the bouquet or a quirky container to help the flowers blend in with an interior design scheme then you’ll not only need to make sure that the bouquet itself fits in with this criteria. Often purchasing these extra items first, and bringing them with you when you are arranging the flowers is more helpful than attempting to picture the finished product while you pick out, arrange and purchase just your flowers.